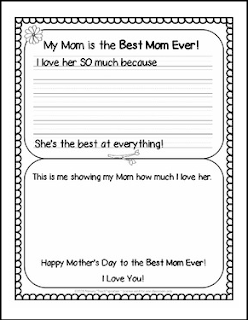 FREE Mother's Day sampler: These FREE Mother's Day printables are samples from my Mother's Day writing activity packet. That Mother's Day packet provides a more in-depth guided activity for students to create a special Mother's Day booklet, while also practicing main idea and supporting details. I hope you will enjoy using this Sampler and that it will be a valuable resource for you! If you like it, please let me know by leaving feedback. * Mother's Day ~ My Mom Is the Best packet here. *Look for the STAR next to my logo ad click it to become a follower. ~ Thank you for ALL you do for your students!